Vladimir Putin told tens of thousands of supporters at a rally in downtown Moscow that he had won Sunday's presidential elections in a “fair and open fight." ""I told you we would win and we won!" 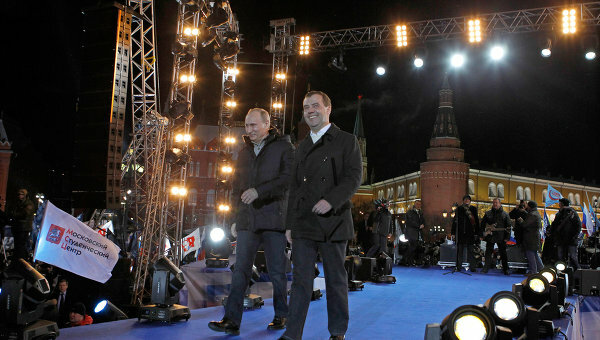 said a jubilant Putin, flanked by outgoing President Dmitry Medvedev, told a crowd of tens of thousands of supporters at a rally in downtown Moscow. "We urge everyone to unite around the interests of Russia," he added, his voice cracking with emotion and his eyes moist. 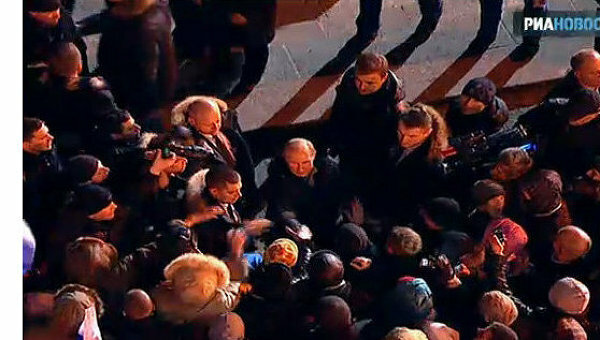 According to preliminary results, Putin is leading with about 63.4 of the vote. His closest competitor Gennady Zyuganov, has gained about 17 percent of the vote. “I cannot recognize these elections as fair, honest and worthy,” Zyuganov said. "I see no reason to congratulate anyone." 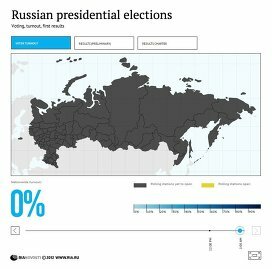 The elections took place against the backdrop of mass demonstrations that were triggered by allegations of vote fraud in favor of Putin's United Russia party at December's parliamentary polls. Protest leader Yevgenia Chirikova told RIA Novosti that she had witnessed “disgusting” vote fraud at a polling station in her hometown of Khimki, just outside Moscow, at Sunday's vote. "These were not elections, but a disgrace," opposition Left Front movement leader Sergei Udaltsov said on his Twitter blog. "They spat in our faces again. "Tomorrow we hit the streets!" There was a heavy security presence in downtown Moscow, with trucks full of riot police parked outside major metro stations. The mood at Putin headquarters was celebratory. “This was the cleanest election in Russian history," Putin campaign chief Stanislav Govorukhin said. As boycotts of Russian vodka spread across the globe in protest over new Russian laws on homosexuality, US gay rights activists warn the campaign could be the first stage in a broader drive targeting Russia’s economy and image with the Sochi Winter Olympics six months away. The first of six Russian submarines, dubbed by the US Navy as “black holes in the ocean” because they are nearly undetectable when submerged, will be delivered to Vietnam in November, the shipbuilder said Monday. Russia’s Military-Industrial Company has developed and tested a hybrid-powered silent armored personnel carrier (APC) that could eventually be remotely operated, a company spokesman said Tuesday. Cartoons: Snowden, will you marry me? Edward Snowden belongs to that generation of militants who do believe in the web as a tool for democratization, and do think that, to some extent, intelligence services of big states intend to monitor and to control the web at the expense of civil societies. These militants want to fight against the "raison d'Etat".